Certain people are born gifted with "It"; something that compels you to watch them. Sarah Palin is one such individual. Though politically tarred, feathered and run out of town on a rail by the Left and a few spineless Republicans, I pray for the day when my favorite gladiator Sarah Palin returns to the arena. Unquestionably, the vitriolic attacks on Palin and her family, the betrayals by Republicans and associates left Palin severely wounded. Who among us could endure and survive the full weight of the MSM launched to destroy you? It is quite understandable and reasonable if Palin were to say, Forget this. Todd and I are goin' fishin'. But, the Bible says to whom much is given, much is required. While Palin has not reported seeing a burning bush, I believe Sarah Palin has been called for such a time as this. I pray she will feel lead to return to Rome (Washington DC) to fight in the arena. At the moment, there is no one in the national arena who inspires the masses to follow and act on their convictions in mass like Palin. Please allow me to re-share my personal testimony of the "Palin Effect." With Sarah Palin as the keynote speaker, Tea Party Express launched one of it's tours in Searchlight, NV, a small dust bowl town. Twenty-five thousand people showed up, RVs parked everywhere because many arrived days early to stake out their spot. From inside our Tea Party Express tour bus as we approached the site, I saw seniors parked a mile away making their way to the event using walkers. It gave me goosebumps. 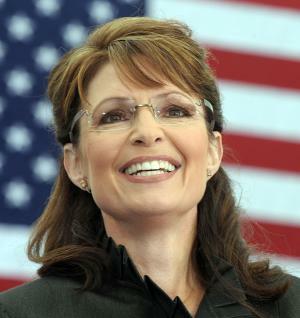 Obviously, this woman, Sarah Palin, represented the America they loved and feared was slipping away. Despite all of the scandals, lies, outrageous government overreaches and abuses of our civil liberties under this administration, Obama still gets a pass in the minds of far too many ill-informed Americans. Decades of dumbing down students have produced exactly what the Left wants, sheep totally dependent on government – clueless regarding U.S. History and the cost and value of freedom. I asked friends at dinner, "How did Ronald Reagan win in a landslide touting Conservatism? Jerry Falwell and his Moral Majority was said to have figured in the mix. Americans, for the most part, are a moral and just people. I believe Reagan touting values which spoke to the hearts and minds of decent people is what inspired Americans to be all they could be. I was a 20 something year old black kid from the East Baltimore projects back then. I knew nothing about politics. All I knew was that every-time I heard President Reagan speak, I felt good about my country and myself. Reagan made me feel I could achieve and contribute to this wonderful country in which I was blessed to be born called America. Where are the voices inspiring folks to love and contribute to the greatness of their country? I know, I know. Such talk sounds corny and naïve today. In Obama's America, signing up for government assistance and approving of government confiscating the earnings of high achievers for redistribution is the new definition of compassion and patriotism. We need a hero folks – someone willing to stand up for America, boldly waving our flag and touting the virtues of hard work, self-reliance, family, God and country. I believe Sarah Palin can pull it off. Reading my own words sound a bit corny even to me. Folks, have we become so cynical, so tainted that asking Americans to strive for goodness and righteousness rather than becoming permanent government welfare recipients is an outdated impossible dream of the past?